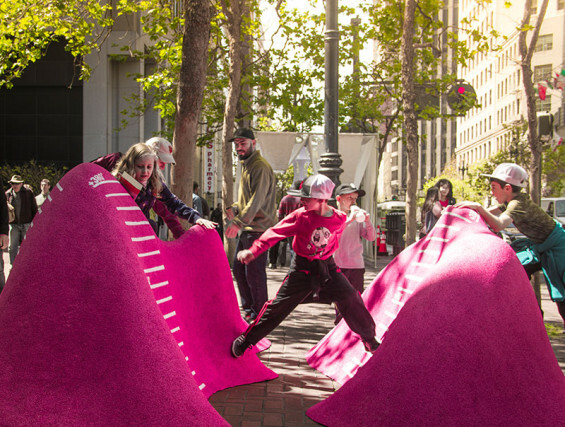 Peak Experience is an exciting installation by ATLAS Lab that was created for the San Francisco Market Street Prototyping Festival – a 3 Day event that took place in April showcasing 50 prototype projects. 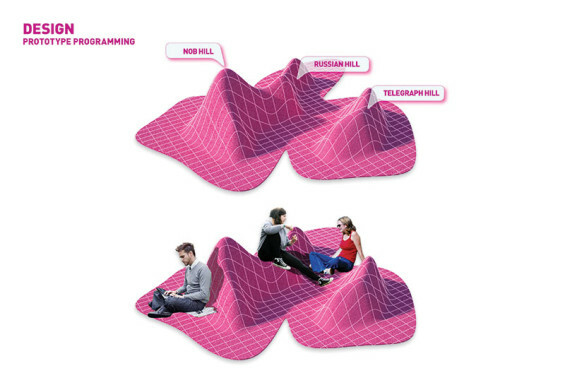 Drawing from the nearly 53 hills that frame San Francisco’s most diverse and engaging neighborhoods, Peak Experience reconceives the hills of San Francisco into a series of varying and undulating mounds that frame a mix of uses that promote the integration of play into traditional street models. Situated in the Financial District of Market Street, Peak Experience builds upon the recreational corridor of the waterfront to establish a strong identity for Market Street through the augmentation of the flexible sidewalk zone to create an active corridor that supports interactive discovery, play and community engagement. 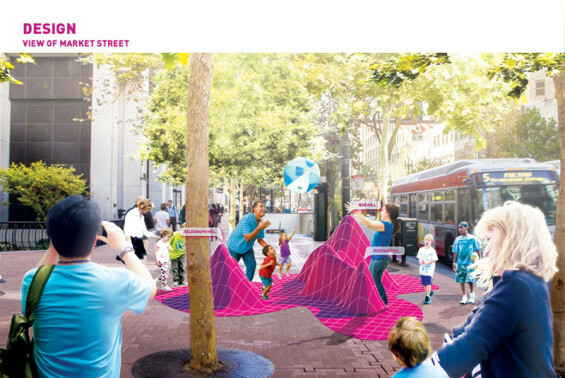 Responding to often static streetscape elements, Peak Experience proposes a soft and flexible sidewalk zone that seeks to introduce a malleable street typology that provide a platform for varying community experiences, while educating visitors about San Francisco topography. 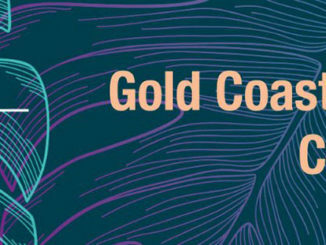 San Francisco’s iconic and majestic terrain is comprised of 53 hills and has curated the City’s most vibrant and diverse neighborhoods. 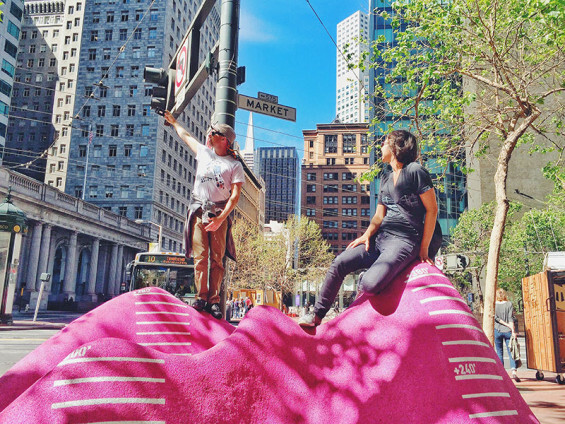 Situated along the “flats” of San Francisco, Market Street provides direct access to SF’s diverse neighborhoods, yet lacks visibility to the hills that frame the City and does not support a vibrant platform for community engagement. 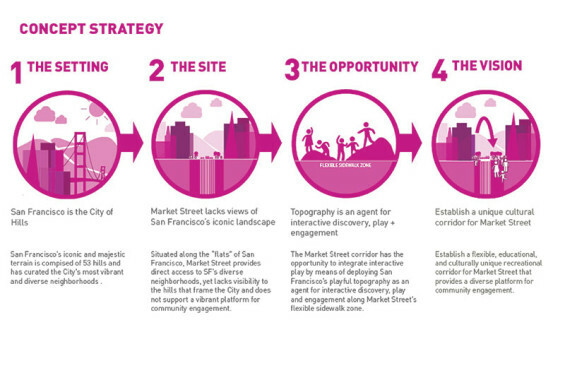 The Market Street corridor has the opportunity to integrate interactive play by means of deploying San Francisco’s playful topography as an agent for interactive discovery, play and engagement along Market Street’s flexible sidewalk zone. 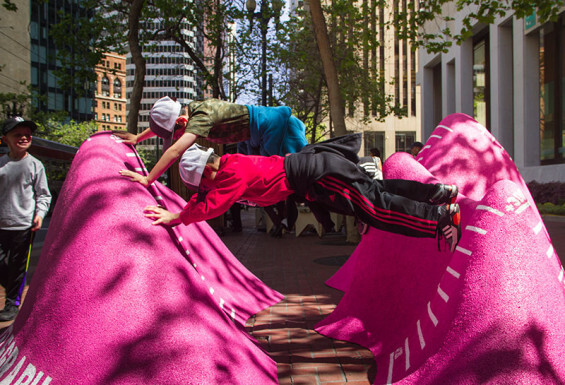 Establish a flexible, educational, and culturally unique recreational corridor for Market Street that provides a diverse platform for community engagement. 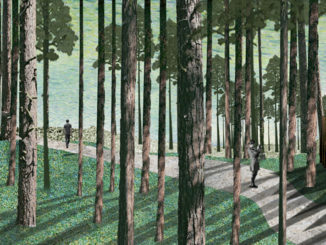 Source: The project title, ‘Peak Experience’ is from Tom Graham’s 2004 SFGate’s article that investigates and highlights the famous hills of San Francisco.